Recently a client, with whom I have been in discussions with on a new logo design project, asked me why my pricing information was so vague. This is hopefully explains my reasoning for not showing specific prices. This article explains this apparent vagueness and also expands on my previous post Indepth look at my freelance logo design process. This is my own personal opinion, so the following is in no way a ‘my way is the best way’. I am purposefully vague on pricing for one specific reason. Over time, I have adopted a simple process of working to a specified client budget. I don’t offer fixed logo price packages or special low cost bundle deals. I touch on some of the problems that I feel fixed rate packages can create in Looking to hire a logo designer. It’s an easy route to take, makes it clear for all concerned, but this route creates longer term problems. Personally, lumping each and every new logo design project into a fixed price category dilutes the whole point of logo design being unique and tailor made. By suggesting all logo designs can be lumped into a fixed price bracket, is saying that you spend the same amount of time and resources designing each and every logo. Inaccurate. This is not how logo and identity design works, by offering fixed rate packages you are helping the client view logo design as simple as 1, 2, 3. It’s the perception of this ‘package pricing’ that creates the problems that as designers, we are trying to avoid. We constantly strive to impress upon people, clients and other professionals how challenging and involved design can be, yet we fall down at the first hurdle. We strive to provide an exact and convenient pricing process, but it’s actually laziness. We can be our own worst enemies in this regard. Convenience sells, sure. But I would argue we are not in ‘the convenience business’. Nothing wrong in making things as seamless as possible, where possible, but accept that certain aspects of how we promote and market our self, says a lot about who we are, and our priorities. Namely, package deal pricing infers, at least to me, an in and out mentality. Boom, boom, boom. ‘We want to be so streamlined, we will sacrifice the details of the very process we should be advocating. That we can’t even be arsed to talk to you at the inception of a logo design to discuss what budget requirements are best for you.’ This approach lacks uniqueness and more importantly, reduces the one-on-one client interaction our very profession dictates we should be good at, communication, both visual and verbal. I purposefully retain this air of mystery over my pricing, exactly for the reason I couldn’t be specific even if I wanted to. This way, I encourage interaction, where I can then proceed to talk in detail about what I can offer each client. Entering into a dialogue that you would not get by ordering online that ‘Premium Logo Package’ through your credit card. I know this process will see some clients hot footing it out of my website, for the very convenience of a package deal found on another logo designers website. But I’m OK with that. The simple and short answer to this question posed by my client is this. The more money you invest, the more thorough a designer can be. Why? Because a fair chunk of the logo design process is based around sketching, idea formulation and research. None of which are 5 minute affairs. Not to mention any additional costs incurred with a meaty project, traveling costs, meetings, purchase of fonts and materials. It’s also not my responsibility to gauge how much a client should invest in a logo or brand identity design, although I will of course help them in coming to a decision that works for them. If I do a logo for £300, the time I can realistically spend in looking at options, research of the company, sketching and actual logo creation will be quite restricted to say a company that put up £2500. The latter meaning I can spend a decent amount of time really ‘getting’ the company, getting into their and their customers heads, which for the most part is essential to creating a strong, unique and appropriate identity. For example, the Keyboard kahuna logo was budgeted at over £1000 and took around 2 months to complete, off and on. If you look at the logo process post it will give you an idea of where and how we got to the final design. Now, had Thomas put up £300, then the design would have suffered terribly, the earlier sketches showing some of the initials thoughts and directions. Because I was not pushed so much for time, I could focus on ‘getting’ the company. Something has to be said with endless tinkering and proud obsession of details. 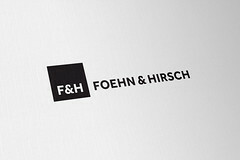 Same with my most recent project, the rebrand of Foehn & Hirsch. They put up a healthy budget and we started actually late last year. As Keyboard Kahuna, it has been on and off, but the result was that we were able to fine tune the ideas and direction over time. Had I had to watch the clock, then I know the final design would not have been any where near as appropriate and well received as the final design has been. A rebrand deserves special consideration when pricing up, there is so much more to take into account and so much more risk is involved. An inappropriate rebrand could kill or seriously hinder any reputation of both designer and client, rebrand wisely. So in answer to my clients question, there is a definitive correlation between the price you invest and what you get in return. It’s not that I ‘just dial down my creativity’ or ‘can’t be arsed’ for a lower paying client budget, it’s just based on a realistic use of time. As it is, I always put far more time into every project than what I am being paid for, but that’s my choice and my perfectionist nature. My rates are therefore not random neither are they based on me trying to milk as much as I can from each client. I don’t see a wealthy businessman and rub my hands in anticipation of relieving him of £3000 for a logo that will serve as a website header for his son’s personal goldfish website. The ideal scenario is a healthy budget and no real urgent need to complete in a few weeks, let alone days. Time and time again, the best idea has evolved over time. Often my first ideas are the final ideas, but what takes time is evolving the visual details to a point where the logo works effectively. I will always do my best to create a visually pleasing logo, regardless of the budget, the difference is in the details and overall suitability. If it’s to represent a possible product, a brand, a large company, then the budget needs to allow for that. My client wanted to see a specific example of both a high and low budget logo design. An example of a cheap and cheerful logo for £200 is Starpuff, and an example of a carefully researched and soundly implemented rebrand for considerably more dosh is Foehn & Hirsch. 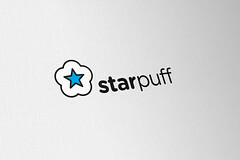 Starpuff is a nice enough logo, but more ‘skin deep’ than ‘deep personality’. If the product, or new business is super important to you, if it will form the basis for your own standard of living, then in an ideal scenario, invest wisely in an identity designer. If it means nothing to you and its just a hobby or for kicks, then makes sense you will not need to break the bank. Given the logo or identity IS the face and visual personality of the company, it would then make sense that one gives it the attention to detail it deserves. I could actually go on and on about justifying prices and budget, but will stop there. For now. « Previous Post: Typography Moustache Chart – What font is your tash?